Anniversaries are often my favourite events. Happy Anniversary to Suzanne and Arthur! I’m so honoured to be part of the entertainment 20 year celebration. The guests are superb and the event professionals are top notch all around. It’s Friday the 13th, avoid ladders and black cats and find your lucky rabbits foot! Why do so many people believe that Friday the 13th is unlucky? My favourite story to explain the origins of bad luck associated with Friday the 13th goes back to the fall of the Knights Templar. On Friday the 13th of October 1307 King Philip IV of France along with Pope Clement ordered that members of the order of Knights Templar be arrested. Many of the Knights were then tortured and burned at the stake. The Knights had been accused of blasfamy, homosexuality, and worshiping a severed head or Baphomet. However, it is more likely that their arrest was a move to usurp their power and wealth. Jacques De Molay, the last Grand Master of the order, requested that he be burned with his hands bound in prayer and facing Notra Dam Cathedral. As he was being burned to death it is recorded that he called out "Dieu sait qui a tort et a péché. Il va bientot arriver malheur à ceux qui nous ont condamnés à mort" (free translation : "God knows who is wrong and has sinned. Soon a calamity will occur to those who have condemned us to death"). Pope Clement died just a month later, and before the year was over King Philip also died in a hunting accident. The story of the Knights Templar is very compelling however, the idea that this is the origin of the superstitions surrounding Friday the 13th is most likely a modern creation. The truth is we aren’t sure why it became such an unlucky day to many. Another theory is that it has a tie to the last supper being a dinner of thirteen guests and Jesus’s execution being on a Friday. This may also be part of the reason that 13 itself is thought to be unlucky. It is also recorded that many believed Friday to be an unlucky day no matter what the date. Its impressive that superstitions can be so powerful that many western buildings omit the 13th floor. The superstition around the number 13 may be in part be due to the Death card in a Tarot deck also representing the number 13 (XIII). I have always found the number 13 to bring me luck instead of hardship. Ask any good Tarot reader what the death card is about and they will tell you that, while it can mean someone’s actual death, it is usual associated with change or transformation. Numerologicaly the number 13 is a combination of 1, which represents the creative potential of an individual; and 3, which represents the expression or act of creativity. It “reduces” to four (1+3=4), where as 4 represents stability and home. This let’s me view the number as a highly creative omen to bring stability to myself and my home and family. So instead of an evil omen, 13 can represent making personal changes toward a more creative and fulfilling life. 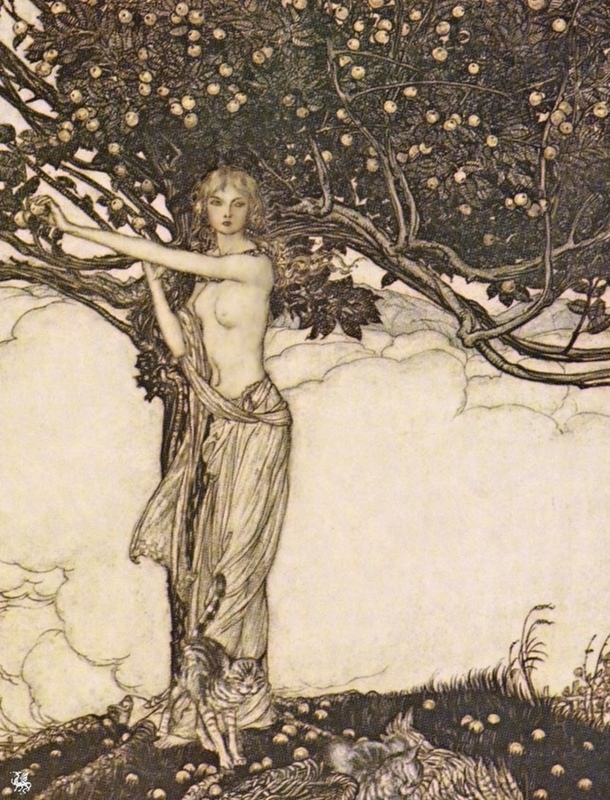 Friday is named for the Norse goddess Freya. Freya represents love, beauty, female sexuality and also Magic in Norse symbology. Freya is represented in the poetic Edda as the “Völva” or Shaman of the Gods. This symbology also lends the idea of Friday towards a time for change. The power of the Völva was to be able to reweave the web of time. They could make predictions and help individuals to change their fate for the better. Part of the reason Friday has been associated with a negative connotation might be in part a feminine subjugation. Today, instead of fear, use the power in the symbolism of Friday the 13th to harness your creativity, strengthen your home and change your fate for the better. Start a new creative project. Focus on how you can help others find their inner creativity. Invike the power of Freya to see more beauty and celebrate love. May you have a happy Friday the 13th! I'm posting this video because the idea of Pareto's law has been applying to a lot for me lately. Just watch and enjoy the nerdy fun. 202 years ago today Franz Mesmer died, leaving the western world to develop and continue developing what we today call hypnosis. While our understand of the subject, ability, or phenomena is constantly developing it remains a very misunderstood field. Ever since the first time I practiced helping someone into trance I have been fascinated that this is even possible. There are so many amazing ways that hypnosis can help people. I urge anyone reading this to explore how they might benefit from it. So take a moment today to learn a little of the history of one of the fathers of hypnosis, Mesmer’s story is amazing and bizarre. Raise a glass in his memory and celebrate exploring the mysteries of humanity. Also in history today Alexander Graham Bell patented the telephone. Have a mesmerising March 5th. Harness tonight’s Full Moon At EOHK. I’ll be reading minds and entertaining at Employees Only tonight. Join me starting at 8 and going late. The full moon is a time for opening your unconscious and strengthening creative ability. It’s also a time to focus on new ideas and see new beginnings. Use it to gain strength and psychic powers. Be the lobster coming from the depths of the sea from primordial beginnings out into the realm of the cosmos, a psychic awakening. Be the wolf and dog and howl for all to hear. Rise to the top of the tower and celebrate your creative power. This is a little experiement. It is an amazing phenomenon that what we say after the word “don’t” is an imbedded command to do just what we are trying to avoid. Think of the last time you heard a parent say “don’t drop your spoon on the floor!” To immediately see the toddler do exactly that. This is because “drop the spoon on the floor” is what enters ones unconscious mind. This is a good little piece of suggestion that is good both to know how to use and how to avoid. We shoot ourselves in the foot constantly because we use the wrong language to communicate with the unconscious. There are many such subtle language tricks I have learned through my study of hypnosis. If you want to see more secrets of suggestion in play come see me at Employees Only HK tonight (I’m there writing this right now) or contact me directly through this page. Harness the power of the Super Blood Moon tonight! Tonight is a rare night indeed as it will be a full moon, a Blue moon, a Super Moon (when the moon is closest to the earth) and a lunar eclipse. Tonight’s moon is so rare that it only happens around once every hundred years. In Hong Kong the visible eclipse starts around now 6:30 will be the most visible around 9:30 and go on till the early morning. (According to the HK observatory). Chances are this will be the only time in your life to focus and harnes this particular energy. Join me at EO tonight to take advantage of this rare event! What to do? This moon creates a strong energy for transformation and manifesting the future you want. Take a moment to go outside and see the moon, meditate and get outside your ego. At some point tonight focus on the future you want to create or manifest for yourself. Make a list, create a vision board, be specific. Have a ritual for goals, and create a sigil. (If you see me at Employees Only I’ll help make you one). If you have a habit you want to break tonight is a good time to make that change. Use this cosmic moment to make a complete change on whatever transformation you have been putting off. Tonight is also a good night to remember your ancestors and ask them for guidence. Synchronicity will be strong, so it’s a great time to work with a divinatory system such as tarot cards or the I Ching. Come see me at Employees Only Hong Kong tonight and I will help you focus this amazing energy. For even more info on the subject of tonight’s moon check out this Daily Mail article and interview with the author of the book “Moon Magic” Diane Ahlquist. Friday Night! Come have your minds blown, and heres a new video! First, I'm soon popping off to Employees Only to perform in the world's SMALLEST psychic theatre. Come see my intimate mentalism show or have a reading. Second, check out the video below, this is from a wedding event I performed at in 2017. It was a great night! Sunday was my birthday and it has been a very productive week so far, especially as last week I was sick all week! I’m so happy to be out and about and healthy! Tonight I’ll be reading minds in the Psychic booth at Employees Only. Come join for a truly mystifying experience! Happy New Year everyone! It’s going to be a great one. 2018, numerologically it’s an 11, a power number. A year for positive growth and changes. A year for inspiration. Join me tonight at Employees Only HK to celebrate bringing on a beautiful new year. As a special tonight I will help folks create a magic sigal toward their goals. Come be inspired and have a mind blowing experience. I’ll be on my way to perform at Employees Only I just finished my 18th out of 28 shows for IFC. If you haven’t caught it, you have only a few more days, what are you waiting for? People always ask when they can come see me perform, and then they don’t show up when I’m doing two public shows a day for 14 days. Go figure. Come celebrate Solstice with a mysterious mind reading show by yours truly tonight! IFC show till the 26th. And back at EO tonight. Hey gang, here’s a back stage selfie and a photo to promote the show I’m working at IFC mall. Shows are at 12:45 and 6:30 PM daily through Boxing Day (Dec. 26). I’ll also be at EO doing readings Wednesday and Friday Nights.